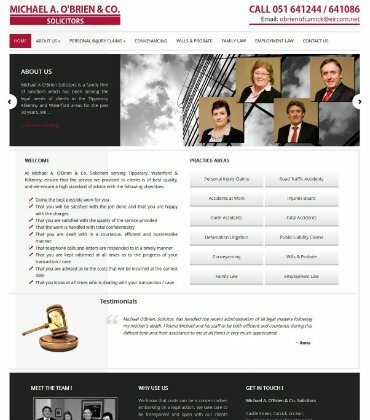 Website Design for Michael O’Brien and Co Solicitors. We were commissioned to deliver a new Website Design for solicitors Michael O’Brien and Co. Solicitors. Michael A O’Brien & Co Solicitors is a family firm of solicitors based in Carrick-on-Suir in Tipperary which has been serving the legal needs of clients in the Tipperary, Kilkenny and Waterford areas for the past 30 years.